Overview A tendon is a band of tissue that connects a muscle to a bone. The Achilles tendon runs down the back of the lower leg and connects the calf muscle to the heel bone. Also called the "heel cord," the Achilles tendon facilitates walking by helping to raise the heel off the ground. An Achilles tendon rupture is a complete or partial tear that occurs when the tendon is stretched beyond its capacity. Forceful jumping or pivoting, or sudden accelerations of running, can overstretch the tendon and cause a tear. An injury to the tendon can also result from falling or tripping. Achilles tendon ruptures are most often seen in "weekend warriors", typically, middle-aged people participating in sports in their spare time. Less commonly, illness or medications, such as steroids or certain antibiotics, may weaken the tendon and contribute to ruptures. Causes Inflammation/strain of the tendon is usually caused by overuse, for example, frequent jumping in volleyball, netball or basketball. It is often also caused by a sudden increase in certain types of training, such as hill sprinting or track running, particularly when running in spikes. Tendinopathy can also be associated with ageing. Our ability to regenerate damaged tissue decreases as we age and the quality of the tendon deteriorates. However, the better news is that sensible training can actually strengthen all our soft tissue (tendons, ligaments and muscle). Tightness in the calf muscles will demand greater flexibility of the tendon, which inevitably results in overuse and injury. Biomechanically, the tightness can reduce the range of dorsiflexion (toe up position) in the ankle, which increases the amount and duration of pronation. This problem is known as overpronation. * This reduces the ability of the foot to become a rigid lever at push off and places more lateral and linear forces through the tendon. This imbalance can translate into altered rotation of the tibia (shin bone) at the knee joint and, in turn, produce compensatory rotation at the hip joint with subsequent injuries to the shin, knee and hip. Pronation is part of the natural movement of the subtalar joint in the foot. It allows ?eversion? (turning the sole outwards), dorsiflexion and abduction (pointing the toes out to the side). Pronation is a normal part of the gait cycle, when walking and running, and it helps to provide shock absorption in the foot. When pronation is excessive, the foot has a tendency to roll inward more than normally acceptable. One sign of overpronation is greater wear on the inside of your running shoes than on the midsole. Lack of stability around the ankle joint can also be a contributory factor, as recurrent ankle sprains appear to be associated with a high incidence of Achilles tendonopathy. Wearing shoes that don?t fit or support the foot properly can be a major contributing cause of Achilles tendon injury. Symptoms Symptoms usually come on gradually. Depending on the severity of the injury, they can include Achilles pain, which increases with specific activity, with local tenderness to touch. A sensation that the tendon is grating or cracking when moved. Swelling, heat or redness around the area. The affected tendon area may appear thicker in comparison to the unaffected side. There may be weakness when trying to push up on to the toes. The tendon can feel very stiff first thing in the morning (care should be taken when getting out of bed and when making the first few steps around the house). A distinct gap in the line of the tendon (partial tear). Diagnosis Diagnosis is made by clinical history; typically people say it feels like being kicked or shot behind the ankle. 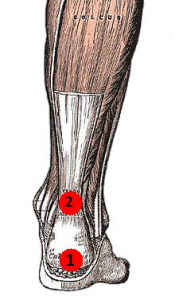 Upon examination a gap may be felt just above the heel unless swelling has filled the gap and the Simmonds' test (aka Thompson test) will be positive; squeezing the calf muscles of the affected side while the patient lies prone, face down, with his feet hanging loose results in no movement (no passive plantarflexion) of the foot, while movement is expected with an intact Achilles tendon and should be observable upon manipulation of the uninvolved calf. Walking will usually be severely impaired, as the patient will be unable to step off the ground using the injured leg. The patient will also be unable to stand up on the toes of that leg, and pointing the foot downward (plantarflexion) will be impaired. Pain may be severe, and swelling is common. Sometimes an ultrasound scan may be required to clarify or confirm the diagnosis. MRI can also be used to confirm the diagnosis. Non Surgical Treatment There is no definitive protocol for conservative management. Traditionally, conservative treatment involved immobilisation in a cast or boot, with initial non-weight bearing. Recently, good results have been achieved with functional bracing and early mobilisation, and it is common to be immediately weight-bearing in an orthotic. Conservative management reduces the chance of complications, such as infection. There is a risk the tendon can heal too long and more slowly. Surgical Treatment An Achilles tendon rupture is a complete tear of the fibrous tissue that connects the heel to the calf muscle. This is often caused by a sudden movement that overextends the tendon and usually occurs while running or playing sports such as basketball or racquetball. Achilles tendon rupture can affect anyone, but occurs most often in middle-aged men.